The National Cancer Institute in the USA started a big project in the 1960s to study the effects of various plant extracts on cancer cells cultivated in test tubes. More than 30,000 extracts from various plants were examined. One of these was the Pacific Yew, the Taxus brevifolia. It showed promising effects and in 1969 a substance was isolated that was named taxol after the Latin term for yew trees, Taxus. The substance was later renamed paclitaxel. In 1993 – twenty-four years later – it was registered in Sweden as a new drug, for use, among other things, for treating cancer of fallopian tubes and breasts. A big problem arose during work with paclitaxel. Yew trees grow slowly and in order to satisfy the American market at the beginning of the 1990s, there was a need for around 25 kg of paclitaxel a year, which corresponds to approximately 38 000 fully grown yews. From a one hundred year old tree it is possible to extract 1 g of paclitaxel, enough for half a course of treatment. There was a risk of exterminating yews. Consequently scientists started searching for alternative methods of producing paclitaxel. It can be synthesised but it takes time and besides, it is extremely expensive. Other varieties of yews can possibly be used as a source of this substance since closely related species often contain similar chemical substances. 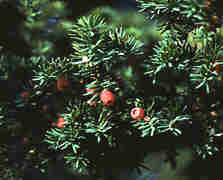 Yew, Taxus baccata, has been found to contain substances which form the first stages of taxol and which can be chemically changed to paclitaxel or similar compounds for drug development. The structure of paclitaxel has also been arousing interest. Are all the 112 atoms in the molecule really necessary or can parts of the substance be used for treatment? It is possible that one could make a smaller molecule with similar properties. In that case, it would be easier to develop a method of producing the drug synthetically more cheaply. Even when a drug has been produced, researchers continue to develop it further for a new generation of drugs. Nicolau, K. C., Guy, R. K., and Potier, P. 1996. Taxoids: New weapons against cancer. Scientific American. (June):84-88.